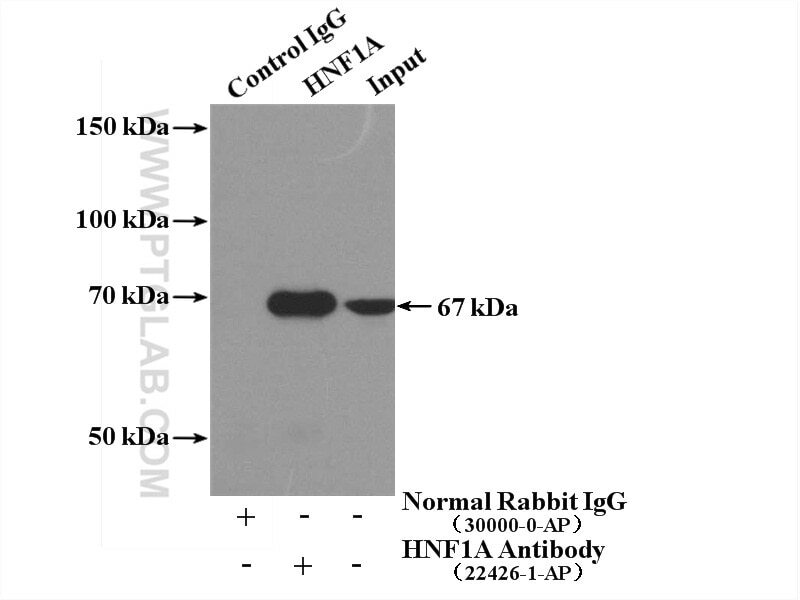 IP Result of anti-HNF1A (IP:22426-1-AP, 4ug; Detection:22426-1-AP 1:800) with mouse liver tissue lysate 3600ug. HNF-1 , a homoeprotein family designated the Hepatocyte Nuclear Factor family. The various HNF-1 isoforms regulate transcription of genes in the liver as well as in other tissues such as kidney, small intestine and thymus. HNF1 as a transcriptional activator that regulates the tissue specific expression of multiple genes, especially in pancreatic islet cells and in liver. It is required for the expression of several liver specific genes and binds to the inverted palindrome 5'-GTTAATNATTAAC-3'.